How’s your New Year’s Bible reading resolution going? It’s February and a notoriously difficult month for those of us who are attempting to read through the Bible from cover to cover or for those of us who are spending a large amount of time reading the first 5 books of the Old Testament. It may be a good time to review the post, “How to Fail at your New Year’s Reading Plan” to keep an eye out for those areas where failure is most often rooted. For example, if you’ve finished Genesis and moved into Exodus, you’re likely to encounter some difficulty in the later chapters of Exodus, particularly as they relate to the instructions given to Moses for building the tabernacle and its appurtenances in chapters 26-40. One way to approach this is to pair this up with the New Testament, particularly Hebrews, to see the purpose of the OT tabernacle, ordinances, and priesthood were to point to their greater fulfillment in Christ. Second, you may note the intrinsic details of these chapters and meditate on the gifts that God bestowed upon His people to construct and fabricate all that He commanded. Third, you may want to meditate on the fact that if God went to such extremes to construct this earthly tabernacle, how much more amazing is the incarnation of His Son Jesus Christ, the True Tabernacle? Finally, understanding these chapters are descriptions of how God is ordering the worship of Himself, meditate on how God has ordered the worship of Himself under the New Covenant. Has he just giving it up to Christian liberty? Has He left us to our own devices to worship Him how we see fit? Certainly if God was this prescriptive in the Old Covenant, there must be something for us to glean for our worship today. A second obstacle may come from the book of Leviticus with its detailed descriptions of sacrifices and offerings. This post on the correlation of Leviticus with Hebrews may be a helpful tool to navigate these chapters. From the macro-view, highlight how often Leviticus (and Numbers) uses the phrase “the Lord spoke” or “the Lord said”. What does this say about a God who speaks? (See also Hebrews 1:1) What does it communicate about Moses? Second, Leviticus is particularly concerned with the Principle of Separation, namely the clean from unclean, holy from unholy, and the sacred from profane. Let this impact how you read and understand the necessity of all of these sacrifices and be overwhelmed at the holiness of God, the sinfulness of man, the EXTREME amount of blood and detailed sacrifices, and then let that carry you into worship of THE Sacrifice, THE Lamb without blemish, THE final sacrifice, our Lord Jesus Christ. The third obstacle will most likely be the book of Numbers. This is a difficult book for me. There are genealogies, complaining, wilderness wanderings, sacrifices, rebellions, complaining, narratives, law, grace, prophecy, complaining, censuses, and more complaining. One macro-view for reading Numbers is to dwell on the Wilderness, the reason why they are wandering, the oft “from one wilderness to the next”, how this is downstream from Adam and Eve’s exile, how this is upstream from Christ’s wilderness (See Matthew 4:1-11), and how the Church today may be in the wilderness like the Church of old (See Acts 7:38 and Hebrews 3&4). Finally, if you’re looking for more help, there is an excellent video series published by the folks at The Bible Project. Below are two on the book of Numbers, but every book is available and provides and excellent big picture overview, much like an introduction. If you are following a daily Bible reading plan and have made it through the detailed tabernacle descriptions giving to Moses in Exodus, then you’re likely into Leviticus otherwise known as the graveyard of yearly Bible reading plans. I say this a bit tongue-in-cheek, but there is a lot of truth in it because most of the time we fail to understand or properly apply Leviticus and give up reading. Like much of the Old Testament, we hear little of it preached and understand even less of it when reading. The wedge that has been driven between the two testaments, beginning with early gnosticism and continuing today with dispensationalism, has served to alienate the Church from the majority of God’s Word. One thing I am personally disappointed about is that I neglected the Old Testament for the large majority of my life and I think it has been a major detriment in understanding the New Testament and properly understanding the continuity of God’s plan of redemption. 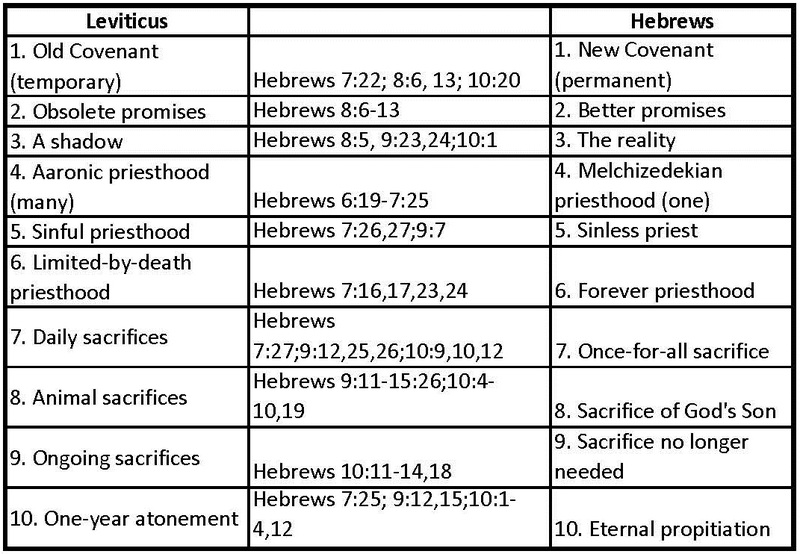 In my daily reading this week, I came across the following helpful charts for Leviticus in MacArthur’s Daily Bible (ironically, MacArthur describes himself as a “leaky dispensationalist” but he seems to rightly recognize and preach the types and shadows of Christ found in the OT). This chart seems helpful for at least causing us to think more about the implications of what we are reading, i.e. more than just the Old Testament sacrificial system for Israel. How is Christ seen in the Levitical offerings? How are the Old Testament sacrifices compared to Christ’s sacrifice?